With the Cranberry Walnut bread out of the way, I'm enthused about the next batch of breads in the book, and today I tackled English Muffins. 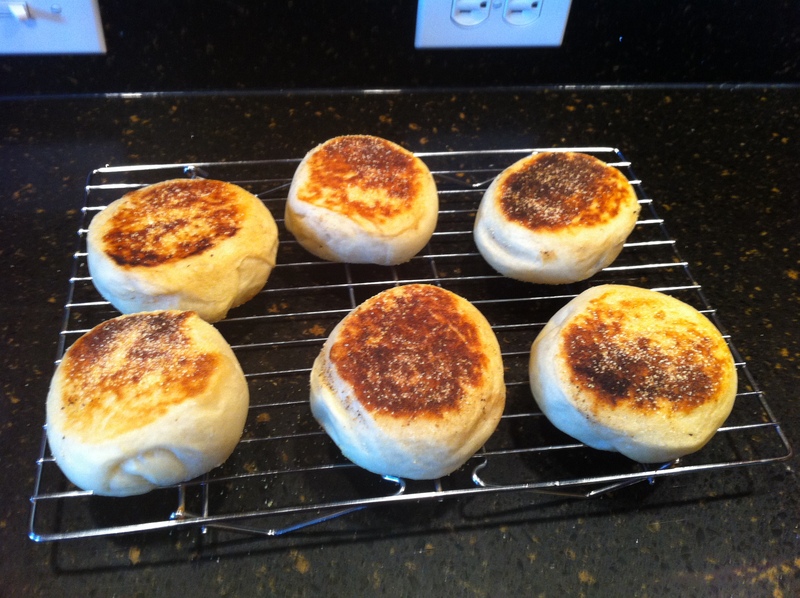 English muffins are different from most other yeast breads as they are initially cooked on a griddle or other flat surface. The first part of the dough was pretty standard, then after the first rise the dough is divided and the muffins are shaped. 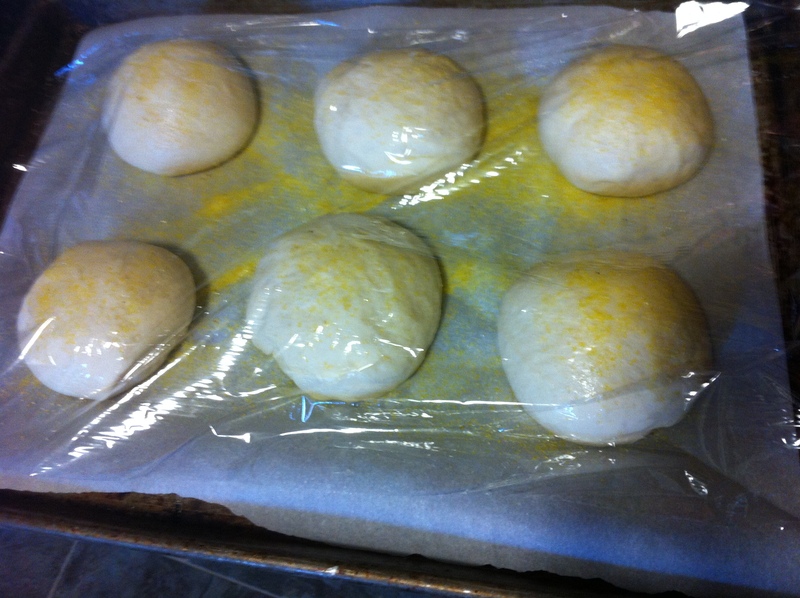 They then rest on cornmeal for their second rise. Cornmeal is also sprinkled over the top. After another hour of rising, the muffins are carefully lifted into the skillet. 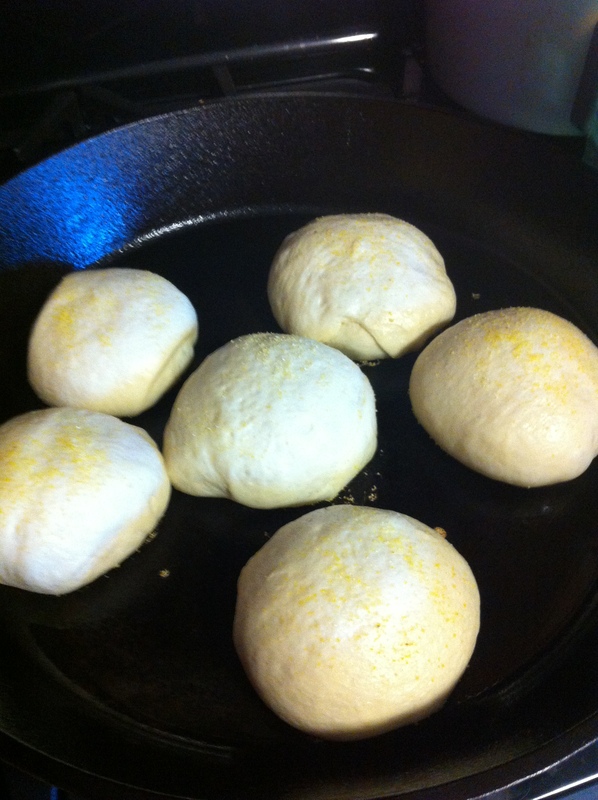 They are puffed up on top, and puff up even more. Once they are flipped, they flatten on the second side. I had a little trouble at this point because my "medium" heat was too hot, so the muffins were getting browned too fast to cook the middle. Next time I will definitely have a cooler griddle. Once the griddle portion is done, the muffins go into the oven to bake for another 5-8 minutes. This is when I was really glad that I have a huge skillet that could cook all six muffins at once, because the instructions were to get the ones that were done into the oven without waiting for the others, so it could have been a bit chaotic. As my muffins were a bit underdone due to the too-hot skillet, I baked them a couple minutes extra. When they came out, the family was hovering in the kitchen, eyes gleaming in hunger. There were loud protests when I told them that they had to cool for half an hour. After 20 minutes I couldn't hold them back any longer. I insisted on fork-splitting them, and then we dove in. They were absolutely delicious. I could probably make them at least once a week and people would complain it wasn't often enough. They rose nicely, flattened nicely, and looked like English muffins. I am very happy with this one.